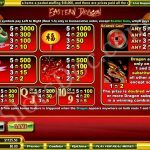 Eastern Dragon is a video slot game that revolves around the mysterious China. This game comes from Nextgen Gaming and it takes us on a trip to the Far East to face the Eastern Dragon. If you are successful you may end up with his untold riches. The sound effects are a perfect match to the theme. The angry looking dragon is the wild in this game, and besides his unpleasant face we want to see this symbol more often on the reels. Its function is to stand in for every other symbol to complete a winning line except the scatter and it will also double each win it is part of. The Chinese dollar is the scatter symbol which offers scatter payouts. To activate the main feature you need the wild symbol. 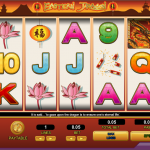 You need to land the symbols on the first and the fifth reel at the same time to receive 15 free spins. 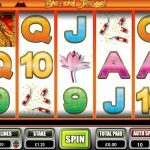 All your wins during the feature will be a subject to a x 3 multiplier and it is also possible to win more free spins if you land more wilds on the appropriate reels. Eastern Dragon is what we would say a mediocre game. Nextgen Gaming has many other titles that are better looking than this one, but that does not mean that this game has nothing to offer. Sometimes we are looking for a more simple game where we can focus on the game play itself, and for that reason they have come up with a game like his one. There are some nice animations here and features that will make the game play not only more interesting but also more lucrative. You just need the luck on your side. For another great engaging game you should consider playing Cool Bananas a 5 reel slot by NextGen.